Subtitle: The Virginia Plan of Government. Such was the widespread contempt of the conduct of the states after only six years of the Articles of Confederation (Articles). Morris encountered no push-back, no scorn in return from his fellow delegates. This squib is in response to some of the Hamilton-Haters I’ve come across over the years, those who variously accuse Hamilton of advocating tyranny and hold him accountable for today’s runaway government, banking system, rapidly inflating fiat currency, and other modern problems for which he is not responsible. Their complaints are shamefully similar to the victimhood we hear of every day from the Left. Rather than attempt to refute all of the mistaken charges levied against this great and essential man, I will examine, over the next three squibs, the convention events leading to his speech of June 18th 1787. I will do so in the context of the existing national situation and atmosphere of the Federal Convention. So, from this and other comments it is said that Hamilton advocated elimination of the states and replacement of the Articles of Confederation with the sort of Leviathan government we have today. We’ll find that his unsubmitted observations, which never went to committee for formal consideration like the Virginia and New Jersey Plans, reflected a practical line of thinking hardly more radical than the plans under consideration. 2. Against dissentions between members of the Union, or seditions in particular states. 3. To the several States, various blessings, of which an isolated situation was incapable. 4. The (ability) to defend itself against encroachment. 5. (Supremacy over) state constitutions. So, out of the Convention’s starting gate, the states should anticipate some loss of their existing sovereignty. Why? Because the states had proven themselves not only marginally capable of self-government, but when joined in Confederation their collective conduct was detrimental to the nation. Randolph then described in general terms the defects of the Articles. Readers who believe the federal convention wasn’t necessary would do well to review his comments. 4. Resolved that the members of the first branch of the National Legislature ought to be elected by the people of the several States . . .
5. Resolved that the members of the second branch of the National Legislature ought to be elected by those of the first, out of a proper number of persons nominated by the individual Legislatures . . .
6. Resolved . . . that the National Legislature ought to be impowered to enjoy the Legislative Rights vested in Congress by the Confederation & moreover to legislate in all cases to which the separate States are incompetent, or in which the harmony of the United States may be interrupted by the exercise of individual Legislation; to negative all laws passed by the several States, contravening in the opinion of the National Legislature the articles of Union; and to call forth the force of the Union agst any member of the Union failing to fulfill its duty under the articles thereof. 7. Resolved that a National Executive be instituted; to be chosen by the National Legislature. 9. Resolved that a National Judiciary be established to consist of one or more supreme tribunals, and of inferior tribunals to be chosen by the National Legislature, . . . that the jurisdiction (include) questions which may involve the national peace and harmony. The 1st Resolution reminded delegates of the unrealized goals/ends of the Articles: the “common defence, security of liberty and general welfare.” Any legitimate government shares these ends and reflect the brief “Life, Liberty and Pursuit of Happiness” clause of our Declaration. The states were not playing well together under the Articles and were responsible for the national unhappiness. Being rational people, the delegates sought an answer to the question, “What means shall the nation take to secure the shared ends of the Confederation?” Only irrational people make ends subject to means. In the 5th Resolution, the Virginia Plan admitted very limited state participation in the second legislative chamber. To whom would its members owe their employment? At best, they would suffer from dual loyalty. At worst, they would soon become creatures of a powerful Congress and have little regard for their states. Resolution Five imperiled state sovereignty. In its negative of state laws, the 6th Resolution strangled what little state sovereignty the 5th Resolution left behind. The “force of the Union” promised military force, and with it, a near-guarantee of Civil War written into a plan of government! Whatever the form of the future executive branch (single or multiple men), the Virginia Plan’s 7th Resolution made it the tool of Congress. Imagine the corruption baked into the cake of this arrangement. The 8th Resolution commingled the executive and judiciary. Here, the Virginia delegation realized their very powerful legislature needed a check. But yikes! More on the judiciary in the 9th Resolution. Peace and Harmony? That’s a wide net of jurisdiction. With this resolution, the courts could fill-in any assaults on state sovereignty overlooked by Congress. Recall from our Declaration of Independence in which we accused the Crown’s judges of working for George III and not the law. All in all, the Virginia Plan of government submitted by James Madison, George Washington, Edmund Randolph, John Blair, George Mason, George Wythe, and James McClurg extinguished state sovereignty. My intent is not to denigrate either the Articles or the Virginia Plan. Just as Michelangelo’s masterpieces started off as ungainly blocks of marble, I can only presume the various delegates accepted the Virginia Plan as the point of departure in a long journey. Some of the brightest minds of the age submitted what we regard today as a horrid plan that unnecessarily neutered the states. No wonder James Madison never accepted the title, “Father of the Constitution.” His Virginia Plan was simply an opening, a proposal to do something about the fast-dissolving Articles. The common belief was that the states, thanks to an inadequate form of governing Articles, were responsible for the sorry condition of the Union. The Virginia Plan reflected this, and made the first effort to restructure government such that the states could do no harm. It took time for this perception to fade into the realization that a new form could secure the proper ends of government while largely relying on previously disdained states. In Part III, we’ll examine the Convention debate from June 1st to the New Jersey Plan of Government on June 15th. McDonald, F. (1979). Alexander Hamilton – A Biography. New York: W.W. Norton & Company. Excellent reference on Hamilton’s political and economic theories that pays special attention to his years as Treasury Secretary. Rappleye, C. (2010). Robert Morris – Financier of the American Revolution. New York: Simon & Schuster. Superb biography of the man behind the scenes who saved the American Revolution. Stourzh, G. (1970). 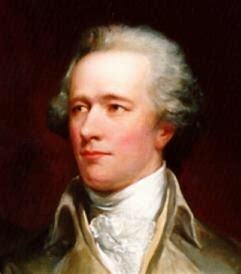 Alexander Hamilton and the Idea of Republican Government. Stanford: Stanford University Press. A scholarly analysis of the meaning of republican government in America’s Founding era.